My love of canals and working boats began in 1971. A group of us hired an ex working boat (Hawkesbury) from Union Canal Carriers at Braunston and set off, on a journey that has lasted a lifetime. I have always loved to draw, but it wasn’t until I was in my 40’s that I was able to study art seriously. I graduated from Exeter College of Art and Design in 1989 with an honours degree in Fine Art. At college I had specialised in sculpture, but once I graduated the desire to paint overtook everything and I’ve been painting ever since. My painting is not about detail – it’s more about leaving things out than putting them in, leaving room for the viewers imagination to get to work. The subjects of my work are things that have moved me in some way – I seldom work to commission unless the subject matter is something I have directly experienced and responded to. I paint almost exclusively in oil; sometimes on boards which I prepare myself, sometimes on canvas. Sizes vary from tiny 6"x8" done on the spot with a pochade box to much larger ones done in the studio. Much of my recent work is about the changing colours of the landscape, seen as I travel the canal system on Thor, the boat I share with Paul. I was accepted into The Guild of Waterway Artists in 1996, having met a fellow member, Dave Rogers, when were were crewing for Mountbatten & Renfrew on the 1995 Jam 'Ole Run. 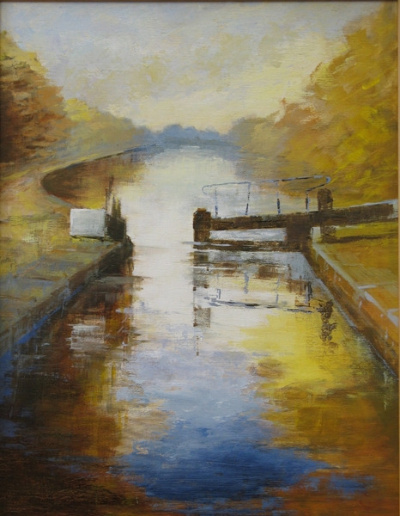 Sarah has been a past Chairperson for the Guild of Waterway Artists.